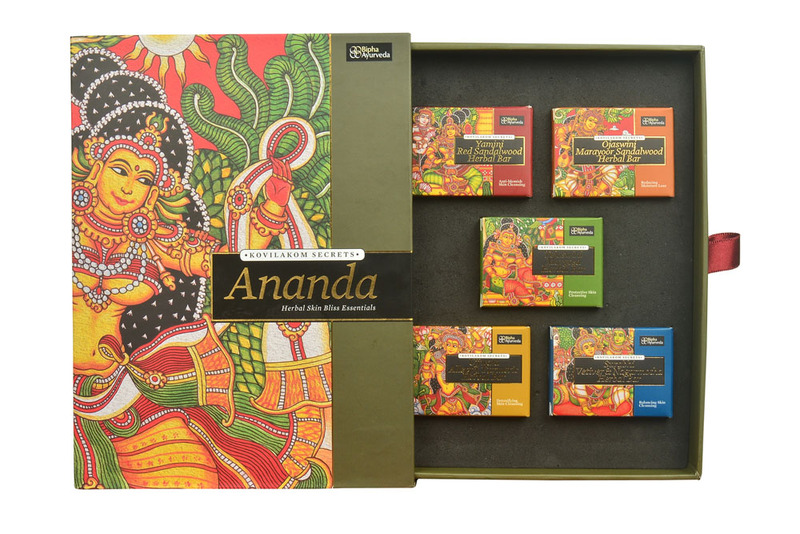 Ananda, our luxe handmade herbal bar collection from Kovilakom Secrets, cleanses and moisturizes the skin with the vitality and healing goodness of five precious herbs from India â€“ red sandalwood, neem, turmeric, sandalwood and vetiver. These delicately fragranced herbal bars are made in small batches with a pure plant base to create blissful bathing rituals. 1. Yamini Red Sandalwood Herbal Bar - Loaded with the blemish-busting powers of red sandalwood, this handmade cleansing bar does just what it promises to do; turn your skin exquisitely beautiful and fragrant. 2. Ojaswini Sandalwood Herbal Bar -Â A luxurious soap infused with pure sandalwood powder and essential oil that revitalizes your skin and leaves it sensuously soft and fragrant. 3. Tejaswini Margosa Herbal Bar - Natural neem lifts away dull, dead cells and cleanses your daily grime to make your skin feel as fresh as nature. 4. Ujjwala Alleppy Turmeric Herbal Bar - This natural body bar deeply cleans to revive fatigued skin and maintains essential moisture for all-day radiance. 5. Surabhi Vetiver & Nagarmotha Herbal Bar - A nourishing herbal bar enriched with vetiver and nagarmotha to create a luxuriously rich bath experience that softens, revitalises and balances your skin.